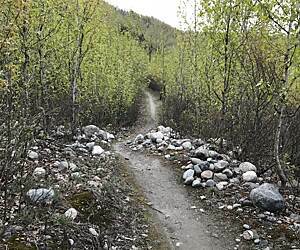 Looking for the best trails around Anchorage? 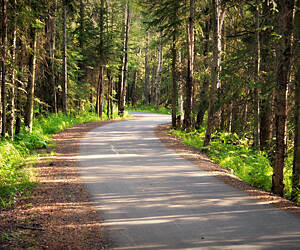 Explore the best rated trails in Anchorage, AK. 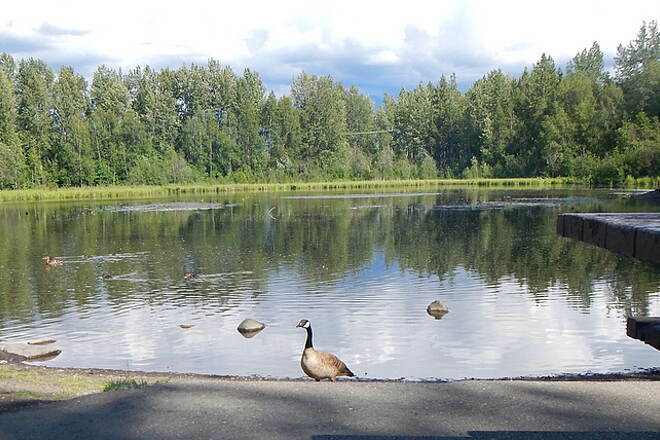 Whether you're looking for an easy walking trail or a bike trail like the Goose Lake Park Trails and Campbell Creek Greenbelt. 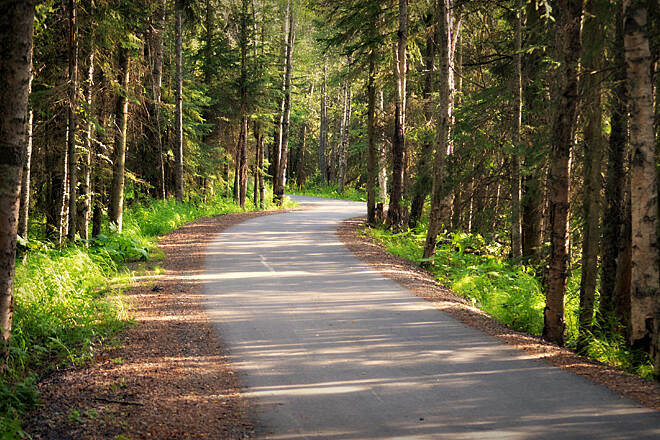 With more than 7 trails covering 45 miles you’re bound to find a perfect trail for you. Click on any trail below to find trail descriptions, trail maps, photos, and reviews. 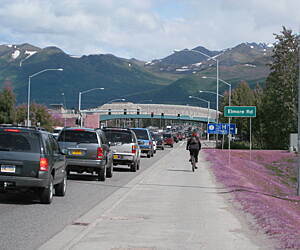 Was working in Anchorage and Fairbanks on travel assignments. Rode this beautiful windy uphill trail from Bird to Alyeska Resort. Ok I know you want to know about the trail, but I want to describe the bear. I saw many a moose while working in Anchorage, not so in Fairbanks, but the bear on the trail will stay in my memory till I die or get dementia. One of my travel nurse buddies paid $800 to take a bush flight to see the bears and here we were a stones throw from one for the price of a bike rental. (We were on assignment in Fairbanks and few to Anchorage for a cosmopolitan weekend) The bear got wind of our sent looked up tilted his head and headed to the woods. We rode on to Alyeska threw down some liquid courage and rode back FAST DOWNHILL WITH 50 MILE AN HOUR TAIL WINDS. It could not have been more exciting!! (They even closed the airport for several hours due to the high winds.) It amazes me how fast one can ride down hill, with tail winds, under the influence, and screaming most of the way-to warn the bears of course. 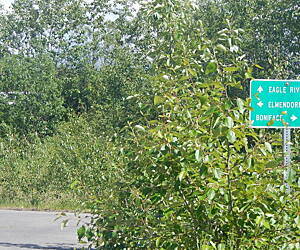 If in Anchorage (and an avid biker) this trail is splendid and should not be missed. A nice little shaded trail following the meandering creek. I made a giant loop by taking the Chester Creek trail to the Tony Knowles trail and then did some on road riding to hitch up to Campbell creek. About 30 miles total. Only minor issue was that you had to cross a major road toward the end. My first visit to Alaska and my first trail. I found this trail amazing, not real hard to bike or walk, wild life, beautiful creek, great sitting areas and a cozy lake as my nephew say's to sit and relax by. Everyone on the trail was friendly from the human to the dog ¿¿. Very great experience! Love it! Chester Creek to Westchester Lagoon. A perfect ride the trail has a few hills and excellent vistas. Bike to Girdwood have ice cream or lunch and then bike back. 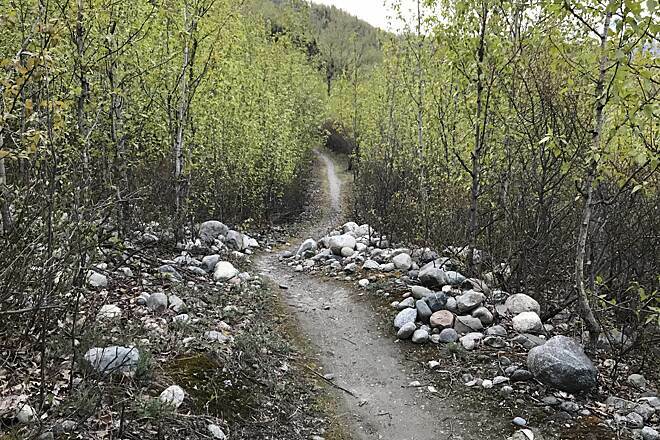 This is a great trail, which travels alongside the Alaska Railroad right of way down Turnagain Arm, just south of Anchorage. 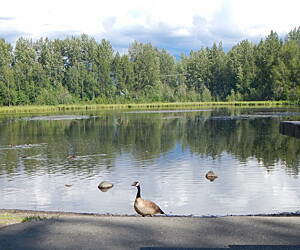 It connects the communities of Bird and Girdwood, hence the name. ( I think it's called Bird because the original residents didn't know how to spell Ptarmigan, Alaska's state bird...) There are often sightings of Beluga whales and Dall sheep along the way, and always the entertainment of the ravens and magpies so common in Alaska skies. 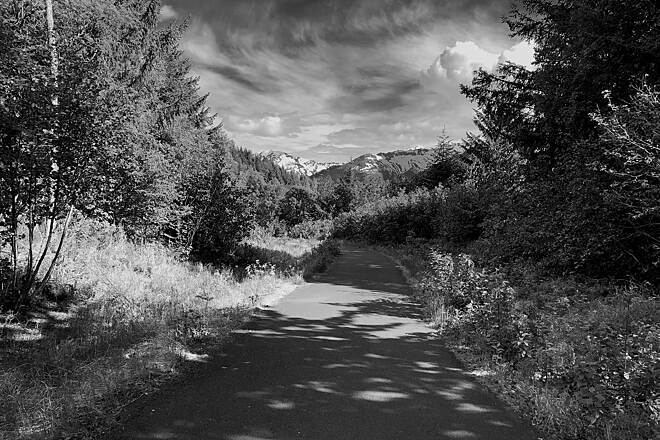 Some of the trail travels through wooded areas, and near the start of the path, at Bird Creek, there is a small state campground--a perfect place to park and ride. Or to camp overnight, if you are making this a part of a longer trip. The trail is mostly flat, at least when it is following the railroad right of way. 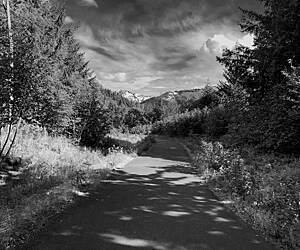 But about halfway along, the trail passes under the Seward Highway and follows the old road, now bike path, up and over a point of land. 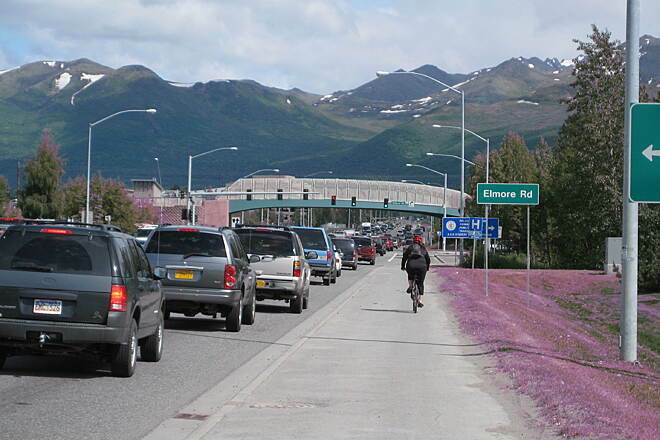 Even then, once you are up on the hill, out of noise of the traffic below, the path levels out until you get close to the Girdwood road turnoff. After that it is all slightly uphill to the town and ski resort, where there is a wonderful cafe and bakery to refresh yourself at! And speaking of refreshing one's self, there are toilets at the campground, at a vehicular rest area just where the bike path goes under the highway, and at a rest station on the path very close to the Girdwood road intersection. This is a delightful afternoon interlude, only about 30 miles south of Anchorage. 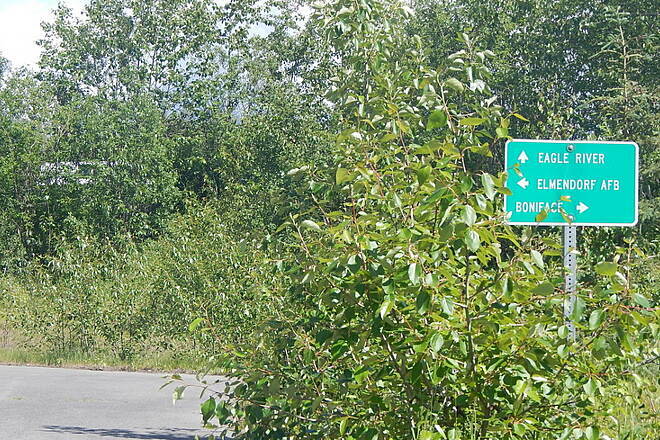 One more proof that the nice thing about Anchorage is that it's only a short distance from Alaska!